Love park is the winner of a 2018 international design competition held by Waterfront Toronto and the City of Toronto Parks, Forestry and Recreation Division for York Street Park in Toronto’s Central Waterfront. The park is designed by Claude Cormier + Associés, with a pavilion design by gh3* architects. 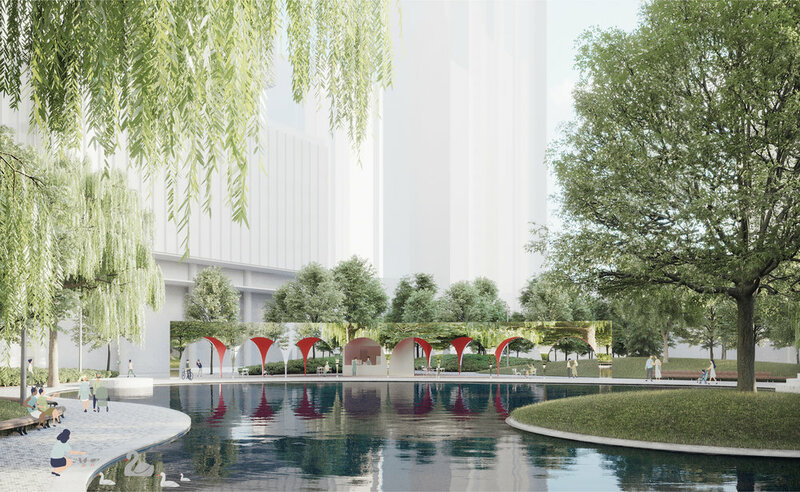 The confluence of pathways establishes the plan for the Love Park pavilion. Arched sides converge to three infinite corners, stretching perspectives and creating an illusion of impossible lightness. Wide arches along the curved walls create a porous perimeter on all sides of this 5m high structure. 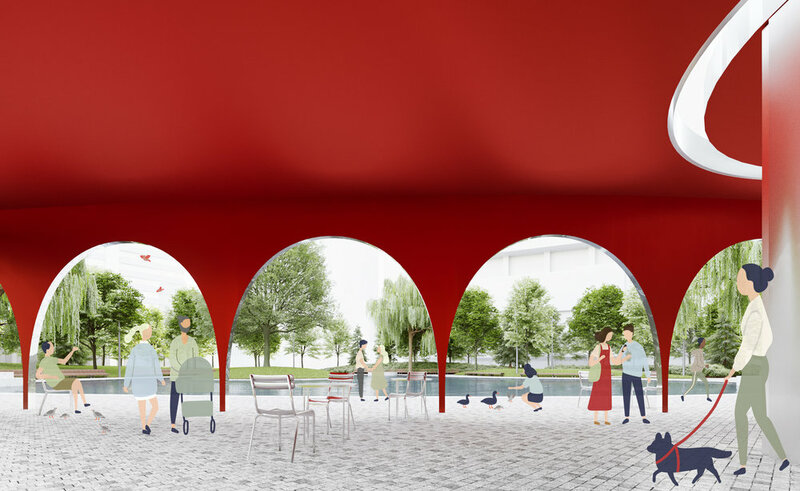 Finished on the outside with mirror-finish stainless steel and lined on the inside with a warm-hued crimson, the pavilion mimics the park’s transition between city and park by asserting a threshold between ephemeral exterior and bold interior. The structure reflects the park and disappears like a mirage, its physical tangibility expressed by the strong hues of the interior. A circular enclosure winterized for all seasons is placed within the curved walls of the arches, hosting a single occupancy washroom as well as a pocket café kiosk. Each of the three curved arch walls rests upon concrete foundation walls that enclose a full heated basement. The basement will house the mechanical room for the reservoir and water works affliated with the heart-shaped basin. It will also be large enough for storage of park elements and some maintenance equipment. Captured rainwater from the building roof will be captured for re-use within the park, with a backup connected to potable water if needed. Electrical panels and the BIA power controls are also proposed to be located in this basement space, designed with provisions to ensure that the space remains dry and warm during rain and cold weather events.